(19589.87.13, Alvin Rucker Collection, OHS). (P2007.187, Devon/Dunning Petroleum Industry Collection, OHS). The Cimarron River originates in northeastern New Mexico and travels east into northern Cimarron County of the Oklahoma Panhandle. While still in Cimarron County, the waterway curves north into Kansas, briefly dips southward into Beaver and Harper counties of Oklahoma, again flows north into Kansas, and reenters the Sooner State, flowing to the southeast and providing the boundary between Harper and Woods counties. Unlike many of Oklahoma's rivers and streams, the Cimarron is not impounded until it merges with the Arkansas River, creating Lake Keystone. Above this, the Cimarron flows freely for 698 miles, dipping as far south as central Logan County, north of present Guthrie, before turning north and finally joining the lake in Creek County. The stream touches Cimarron, Beaver, Harper, Woods, Major, Blaine, Kingfisher, Logan, Payne, and Creek counties and incorporates a drainage basin of approximately 18,927 miles. 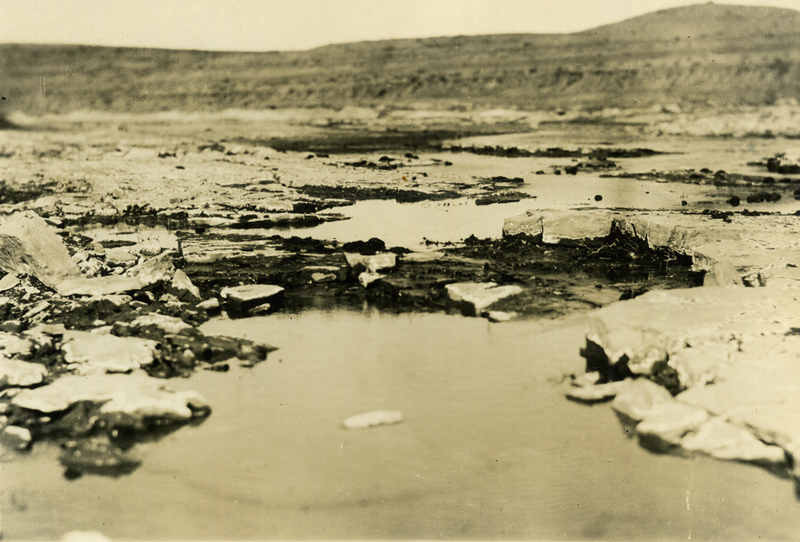 Coursing through natural mineral deposits, salt plains, and saline springs, the Cimarron supplies the Arkansas River with a large amount of minerals. For this reason, much of the Cimarron's water in Oklahoma is of poor quality. Early explorers and cartographers called the Cimarron many names, including Grand Saline, Jefferson (in John Melish's 1820 U.S. map), Red Fork, Salt Fork, and Salt River. Cimarron derives from a Spanish word signifying "wild or unruly." In 1541 Francisco Vásquez de Coronado had to cross the river on his journey to and on his return from Quivira in central Kansas. The Osage had trails to the area where the Cimarron and Arkansas converge and westward prior to the United States' exploration of the country. In 1819 Thomas Nuttall explored the Cimarron from the present Logan County area back to the Arkansas, reporting on the flora and fauna. After Mexico overthrew Spanish rule in 1821, William Becknell opened the Santa Fe Trail to trade with Santa Fe, New Mexico. He may have returned to Missouri via what became the trail's Cimarron Cutoff, which extended through the Oklahoma Panhandle. He definitely used the shorter route on his second trip in 1822. Although dangerous, the cutoff emerged as the favored route for early traders and crossed the Cimarron at Willowbar, eleven miles north and eleven miles east of present Boise City. Also in 1821 Thomas James Followed the Cimarron from the Arkansas, blazing a route to Santa Fe but arriving a little later than Becknell. In 1831 Lt. James Dawson explored the Arkansas to the Cimarron, and a year later Washington Irving's renowned party traveled near the same location, continuing west along the Cimarron, before turning south and exploring central Oklahoma. In 1834 Maj. George Birch established the short-lived Fort Arbuckle near the river's mouth. In 1843 Capt. Nathan Boone led a fact-finding mission into northeastern Oklahoma and Kansas, exploring portions of the Cimarron in present Harper, Woods, and Woodward counties. In the mid-nineteenth century sheep herders from New Mexico pastured their flocks on the native grasses in the river's watershed as far east as the present Oklahoma Panhandle. The West Shawnee, Chisholm, Great Western, and Jones and Plummer cattle trails all forded the Cimarron. The Chisholm crossed it northeast of present Kingfisher, the West Shawnee traversed the river near present Cushing, and the Western and the Jones and Plummer met the stream in Kansas. At the turn of the twenty-first century agriculture and ranching remained the main economic enterprises in the Cimarron basin. Seymour V. Connor and Jimmy Skaggs, Broadcloth and Britches: The Santa Fe Trade (College Station: Texas A&M Press, 1977). James Gardner, "One Hundred Years Ago in the Region of Tulsa," The Chronicles of Oklahoma 11 (June 1933). John Morris, Charles Goins, and Edwin McReynolds, Historical Atlas of Oklahoma (Norman: University of Oklahoma Press, 1976). National Park Service, Santa Fe National Historic Trail: Comprehensive Management and Use Plan (Washington, D.C.: U.S. Department of the Interior, 1990). Oklahoma's Water Atlas (Norman: Oklahoma Water Resources Board, 1984). Jimmy Skaggs, ed., Ranch and Range in Oklahoma (Oklahoma City: Oklahoma Historical Society, 1978). 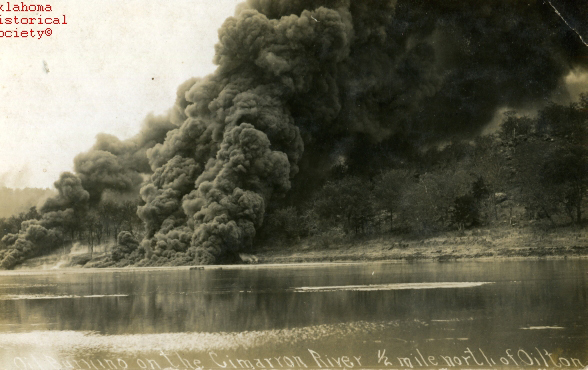 Larry O'Dell, "Cimarron River," The Encyclopedia of Oklahoma History and Culture, https://www.okhistory.org/publications/enc/entry.php?entry=CI004.